Pecha Kucha is an event for architects, designers and technologists. ~15 speakers each present exactly 20 slides. Each slide automatically advances after 20 seconds. 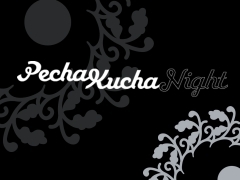 Pecha Kucha Boston is hosted by Harvard GSD at Gund Hall, 48 Quincy St, Cambridge, MA. The event is free and open to the public. Pecha Kucha Boston is organized and curated by Brett Stilwell, Electronic Max, Ivan Shumkov, Paul Jamtgaard and Sonya Mead. Contact us.